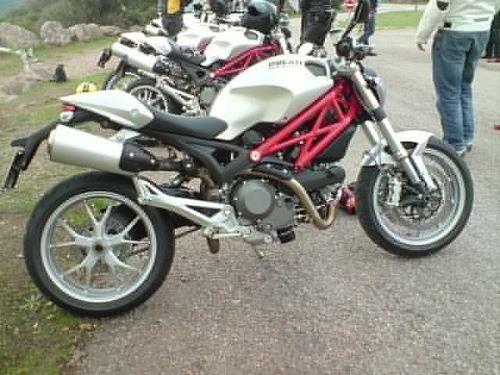 ﻿ New Ducati Monster 1100 First Ride! New Ducati Monster 1100 First Ride! "The new Ducati Monster 1100 lives for mountain roads and through town maneuverability"
MCN Chief Road Tester Trevor Franklin is currently testing the all-new Ducati Monster 1100 in the mountains around Cannes, South of France – here are his first impressions. “From 200 yards away it is unmistakably a Monster; from two yards away it is also unmistakably brand new in every sense. Much like the 696 that appeared earlier in the year Ducati have gone through every component and changed it for the better. "From small detail like clutch actuation – it is much lighter at the lever – to the beautifully sand cast single-sided swing arm. The unmistakable booming engine noise is still with us at high rpm, too. "To keep this new bike in the same mould as the original M900 the quality of ride is exemplary – the Showa forks and Sachs rear shock work in perfect harmony. For Trevor’s full test see this week’s MCN, on sale Wednesday 1st October.